Spongebob Squarepants SPONGEBOB ISN'T GAY!!!! He isn't gay. Many people say he is. Sure he acts a teeeeny tiny bit girly sometimes, but I still think he's not gay. You guys are with me right? I will kill someone who says that spongebob is a gay~!!!!!!!!!!!!!!!!!!!! I don't think he is gay. Besides, Steven Hillenburg said that they are all A-sexual. He said that anything they do that might be perceived as gay qualities are for humorous reasons, and that is all. There is NOTHING wrong with gayness whatsoever, but I really wish people would stop making SB and the gang the poster-child of gay sexuality. i dont think he is he married sandy. Spongebob Is Not Gay I Can Prove It. In The Episode "Surprise Sandy Day" When Spongebob Gives Sandy Flowers And Chocolates. In The Episode "Tree At The Treedome" When Spongebob And Sandy Dating. In The Episode "Karate Island" When Sandy Starring,Smiling,Touching Spongebob 4 Times. In The Episode "Karate Choppers" Spongebob Hallucinating Of Sandy And Go Picnic At The Park With Sandy. 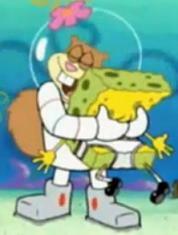 In The Episode "Sandy,Spongebob And The Worm" When Spongebob Don't Want Sandy To Die And Spongebob Jump TO Her Helmet And Cry And When Sandy Got Nearer Spongebob Hugged Her And Cried. In The Episode "Pre-Hibernation Week" When Spongebob Gone Missing Sandy Asked All The People To Find Spongebob When Sandy Got Tricked When Somebody Said "There's Spongebob" Sandy Looked Where They Pointed She Looks Like Really Liked Spongebob Back When Spongebob Is Not There She Feels Very Lonely And Looked On Her Own When Sandy Did Not See Spongebob She Screamed "Spongebob Where Are You!" When She Found Spongebob She Hugged Him. In The Episode "Truth Or Square" They Really Got Married At Last. SPONGE BOB IS NOT GAY!! !